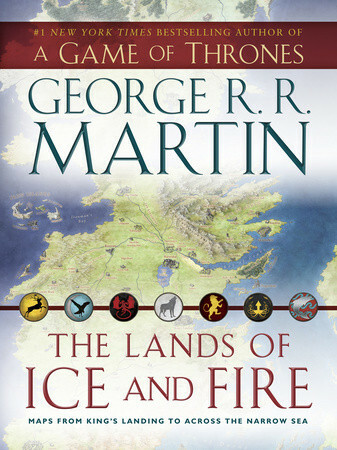 George R. R. Martin’s beloved Song of Ice and Fire series, which started with A Game of Thrones, is bursting with a variety and richness of landscapes—from bitter tundra to arid wasteland and everything in between—that provide a sense of scale unrivaled in contemporary fantasy. Now this dazzling set of maps, featuring original artwork from illustrator and cartographer Jonathan Roberts, transforms Martin’s epic saga into a world as fully realized as the one around us. 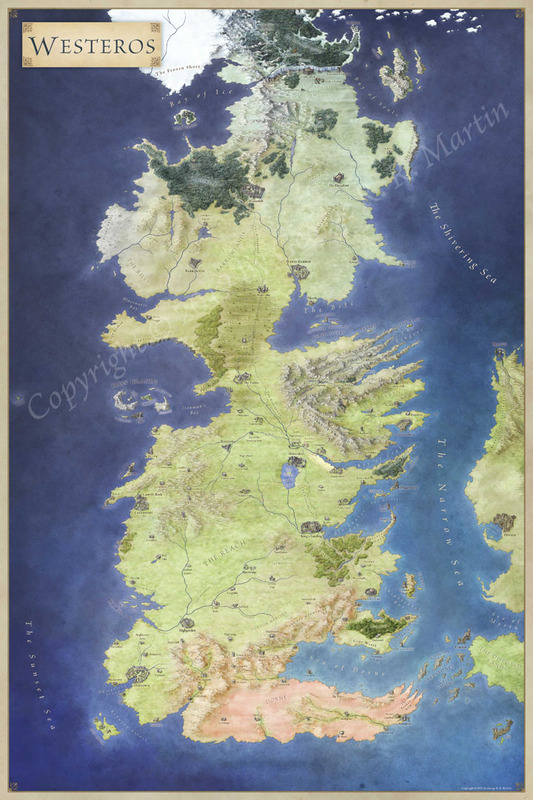 The centerpiece of this gorgeous collection is guaranteed to be a must-have for any fan: the complete map of the known world, joining the lands of the Seven Kingdoms and the lands across the Narrow Sea for the first time in series history. But this is just one of many unique maps that aren’t available anywhere else. There is an alternate version that tracks the movements of the series’ protagonists throughout their vast world, along with more detailed versions of the western, middle, and eastern thirds of the world; a full map of Westeros, combining North and South; one of the Dothraki Sea and the Red Wastes; and the Braavos city map. And here, too, are fan favorites detailing everything from urban sprawl to untamed wilds: maps of King’s Landing; The Wall and Beyond the Wall; the Free Cities; and Slaver’s Bay, Valyria, and Sothyros. Never before has the entire scope of Martin’s universe been so exhaustively and fascinatingly depicted. The maps in this beautiful, one-of-a-kind atlas will enrich your reading or viewing experience, provide another view of your favorite characters’ epic journeys, and open up captivating new worlds—plus, they’ll look great on any castle wall. It’s hugely exciting to be involved in a project set in a world I’ve followed for so long. You can find out more information on the project here and here, and the Amazon page here. Congrats on a huge contract, Jon! I actually caught an article yesterday online about your big land and I was going to stop by today to say congrats! BTW, love your work in CC3. I do have your annuals and they are among my favorite styles of mapmaking! Yep, I realised it was only a matter of time before this spread across the internet 🙂 I’m glad you’ve been enjoying my Annual Styles for Profantasy. It’s strange but wonderfully satisfying to see my map style appearing across the internet in Profantasy maps. Thanks for the reblog too – much appreciated! Fantastic map-maker, Jon Roberts, lands the George R. R. Martin contract to map out the fabulous world of Game of Thrones! I shudder for the hope one day I could hire a map-maker of Jon’s caliber. That’s fantastic, Jon. Truly congratulations. Congratulations from a fan of your work and R. R. Martin! Congrats! I’m looking forward to getting my copy signed. And awesome! I’m now much fewer degrees away from GRR Martin! I know i played with a crappy map in a http://greenronin.com/sifrp/ (song of fire and ice) rpg. That’s great. There’s so much of Martin’s world that is not mapped in the paperbacks, and I’ve always wanted to see a full globe showing all of the various locales. Congratulations, Jonathan! I’m glad to see that your talent gets the recognition it deserves! It really is – so glad to be able to share this publicly! Wow, what a project to work on. Awesome! I have always been impressed with the quality of work you have provided to the industry. Your work was astonishing with Breaking of Forstor Nagar. Obviously you are merely getting what you are due. By the mock-up alone, I am really impressed and excited by the potential. Please keep us posted! That’s absolutely amazing. Congratulations on such a highly visible project! Great news. Makes me wish I had a bottle of Irn-Bru to raise in your honour – guess I’ll have to settle for a glass of 20-year-old Glenfiddich. This is so fantastic!!!! I can’t wait to see these. Brilliant books combined with your amazing skills. I am very excited!! Just got the news about this and it took me about 12 seconds of browsing your site to pre-order. I’m really excited about this! Huge congratulations to you! I actually first saw your work through the Ilkor game but Ive been a big fan since and this is well deserved. Would there be any signed copies? Possibly, but that’s going to be up to the publishers once this is out.